eBay deal of the year. Installed all the props backwards. Oops! 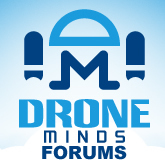 Discussion in 'General Drone Forums' started by photojunky, Dec 11, 2018. I got a great deal on a Tarot T810. It came with some good quality parts. Just the motors alone cost more that the entire deal. I did however install all the props backwards so if you want to know what happens, check out the video. Ha, been there before! My friend did the same thing a few years ago and was puzzling over it for ages, but I knew right away what the problem was because I'd done the same thing myself a couple years earlier! I was just lucky it was all instead of just one.